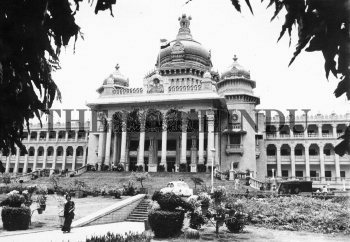 Caption : "Government work is God's work", said the inscription on the Vidhan Soudha in Bangalore, the Capital of the southern Indian State of Karnataka. The slogan was coined by the then Chief Minister of the State, Mr. K.Hanumanthaiah. But Pothan Joseph, senior journalist who was opposed to Hanumanthaiah made fun of the slogan and wrote: God does not need man's work.